To read this special section, purchase a print or digital copy of the May-August 2015 issue of WLT. To the students in my magazine publishing class, I often cite Michael Robert Evans’s assertion that “editing is primarily about people,” not words. By extension, universities are less about buildings and the spaces—geographical or intellectual—they occupy than about the people who inhabit and enliven them. And for a campus-based literary magazine like World Literature Today, one of the great privileges of working with authors from around the world is that we get to introduce these writers to our students and faculty/staff colleagues here at the University of Oklahoma, our home. 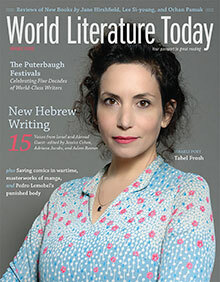 Since 1968, twenty-seven internationally renowned writers have taken part in what is now known as the Puterbaugh Festival of International Literature & Culture, a tradition that has benefited thousands of students who are given the opportunity to meet these world-class authors in person, read their work, and engage in discussions about the importance of literature in a global era. When the writers visit the OU campus in Norman, a semester-long course is based on their work, and many of the students receive full-tuition Puterbaugh scholarships to take the class; a public symposium with a range of international authors, translators, and scholars is built around the marquee writer’s presence; and several days’ worth of cultural events take place—including, in recent years, poetry and fiction readings; dance, theater, and musical performances; and museum exhibits. The festivals are made possible by a generous grant from the Puterbaugh Foundation of McAlester, Oklahoma, and continue to be a living tribute to J. G. Puterbaugh (1876–1965), an Oklahoma philanthropist, entrepreneur, and civic leader who loved poetry and believed it to be a source of cultural enlightenment and a means for understanding other cultures from around the world. Mr. Puterbaugh—a voracious reader who taught himself Latin—also believed in learning foreign languages as a primary means of gaining insight into other cultures. In 2015, fifty years after his death, the editors of WLT decided to present this celebration of the Puterbaugh legacy in the present issue, with contributions by six writers who have taken part in the festival in recent years. When the University of Oklahoma presented Mr. Puterbaugh the Distinguished Service Citation in April 1951, President George Lynn Cross paid him the following tribute: “J. G. Puterbaugh used a free hand to scatter to others the benefits he could have claimed for himself.” One of the most famous landmarks on the Norman campus is the statue of the seed sower, a drawing of which is part of the official university seal. What better way to characterize the literary legacy of Mr. Puterbaugh himself?